London - Crystal Palace's Wilfried Zaha and Glenn Murray sealed a 2-1 win over Stoke City in an entertaining midtable Premier League clash at the Brittania Stadium on Saturday. Ivory Coast-born England winger Zaha showed few signs of the hip injury which troubled him in last week's 3-1 win against QPR in which he also scored, as he netted the match winner minutes after a Murray penalty. All three goals came in the first half with Senegalese striker Mame Biram Diouf putting Stoke ahead on 14 minutes with his ninth goal of the season. The hosts had looked firmly in control early only to concede a penalty minutes before the break. 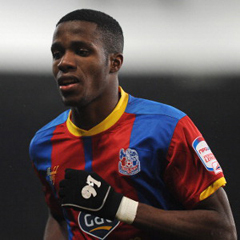 Murray stepped up to convert and was followed closely by Zaha's winner in the last action of the first half. Since manager Alan Pardew's arrival in January, the Eagles have been soaring and continued their push up the table to move 11 points clear of the relegation zone. "Character got us the win today and this is one of the best teams I've managed for that. Incredible character," said Pardew, who believes his side are just one point away from safety. "To get to 36 points is us done, really. With eight games and the way we're playing you'd expect us to be there." Palace's Murray and Yannick Bolasie both missed early shots at goal with Diouf also having an effort blocked after 11 minutes. But the Senegalese forward made no mistake three minutes later. Charlie Adam's free-kick deflected off Palace's Damien Delaney into the path of the Stoke forward, who fired past Julian Speroni from close range. Senegalese striker Pape Souare came close to opening Palace's account after 37 minutes only for his header to go wide. But the visitors levelled through Murray's penalty three minutes before the break after an Asmir Begovic foul on Bolasie. The visitors pulled ahead just before the break when Murray headed a cross to Zaha to fire into the net. Both sides had chances early in the second half with Diouf flicking in a low cross from Charlie Adam but Speroni held firm. Another Zaha low cross was half-cleared but went straight to Jason Puncheon, who spooned over the bar. Stoke poured forward but Palace's Scott Dann and Delaney did well to close down defence to secure their fifth away win of the season. Palace are now 11th with 36 points, two places below Stoke.